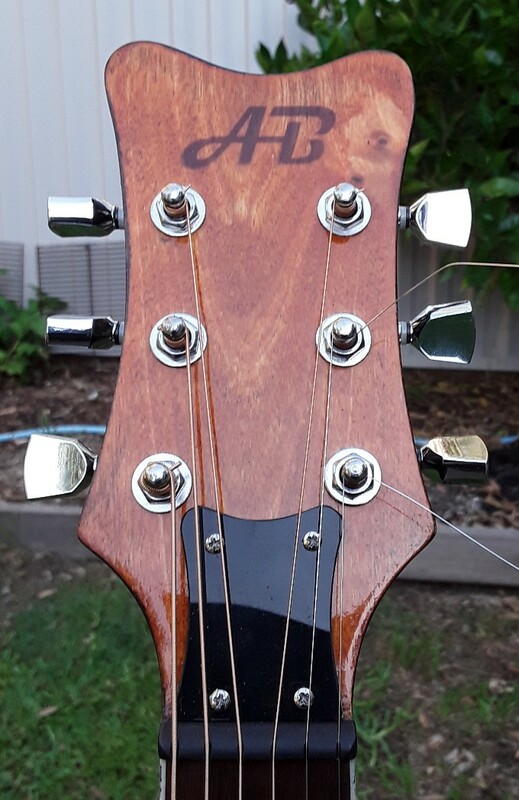 Marshi’s Custom IB-7 with Reverse Headstock is GOTM for March/April 2019. 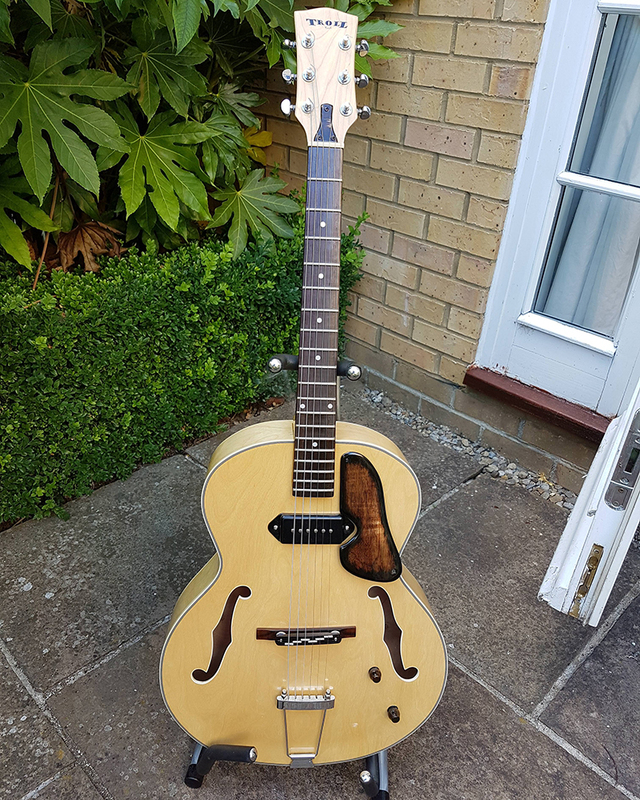 Richy17’s JTL-1 is GOTM for February 2019. Congratulations on a stunning build. 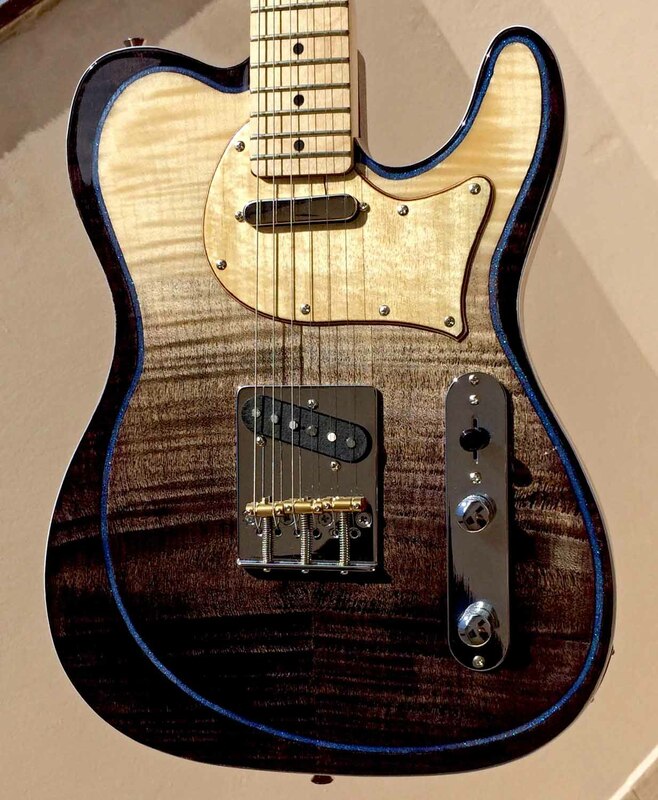 Overall i really enjoyed this build, Its really nice to play and has that tele twang about it but with a little more oomph in the neck. The string through drilling didn’t go the best but i learnt some valuable lessons there. Probably if i was to do it it again i would take a little bit more off the top horn. Congratulations Yo_Wattup, your TLA-1 is the Judges’ pick for GOTM January 2019. 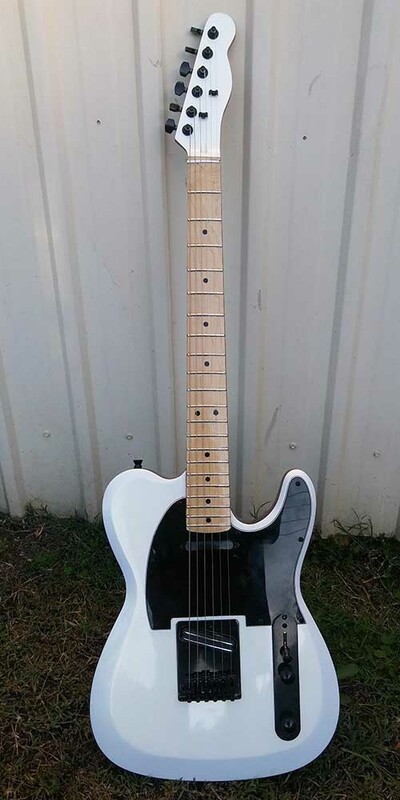 This is a Pit Bull Guitar kit I bought a few months ago and finally got around to finishing. 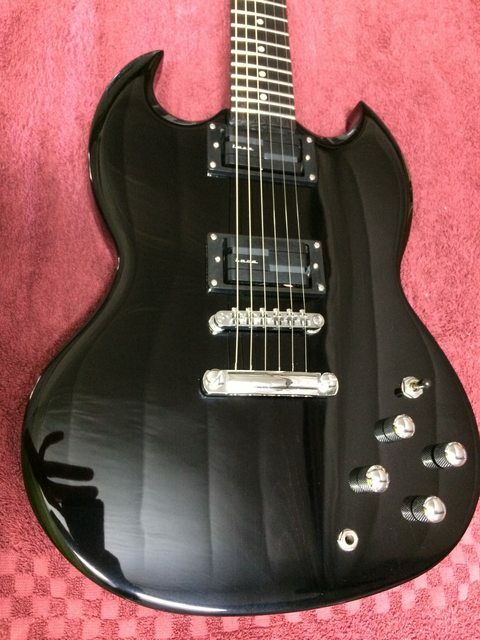 It’s the TLA-1 with ash body and black hardware. 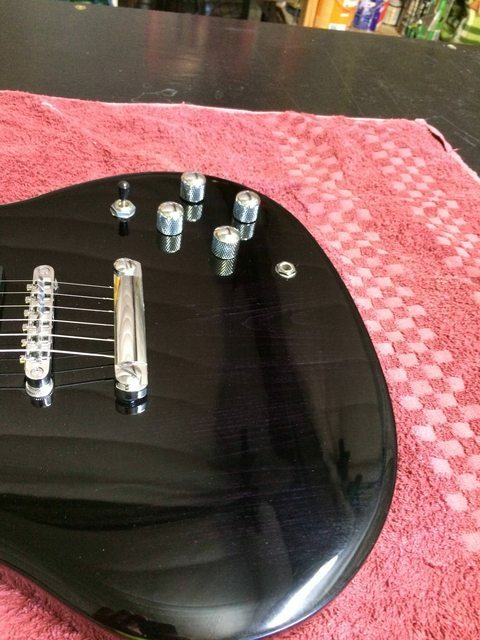 I replaced the bridge and bridge pickup. 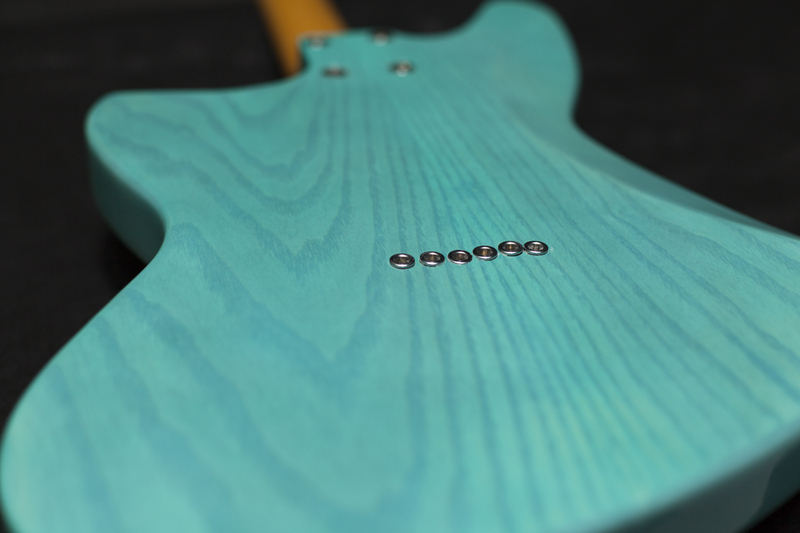 For me, kit guitars are all about the look, I spend a lot of time on the finish. As you can see I’ve added bevels to the top and a curved edge on the bottom side. What isn’t so obvious is the ghost gold pearl over the white top. This is very hard to capture on camera and its visibility depends on the lighting, basically its completely white under ubiquitous light (shade), and the gold pearl emerges when under sunlight or artificial light. 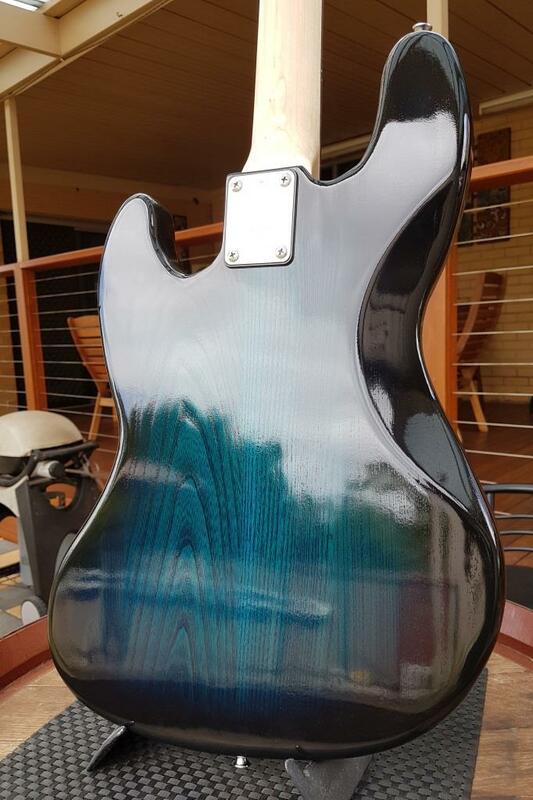 For the back and sides I wanted a mirror gloss finish of the ash – no texture. So I filled the grain, stained it walnut and sprayed it with varnish until there was enough layers to wet sand and get completely flat. Something like 20 coats. 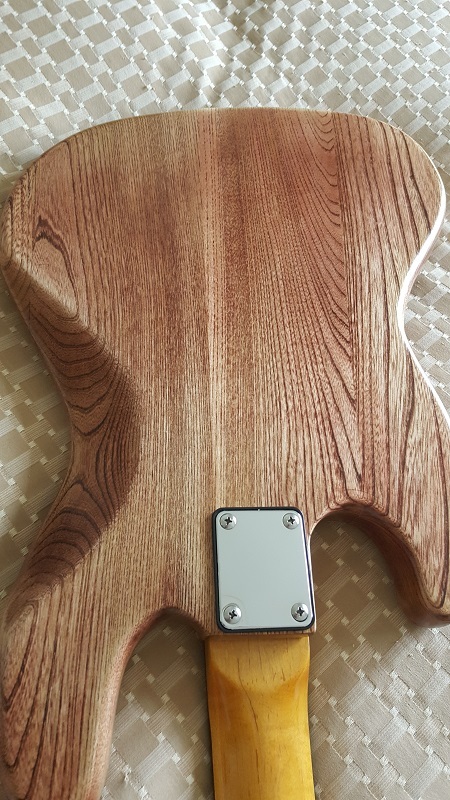 I also stained the neck a walnut colour to match the back but I left the fretboard its natural maple. 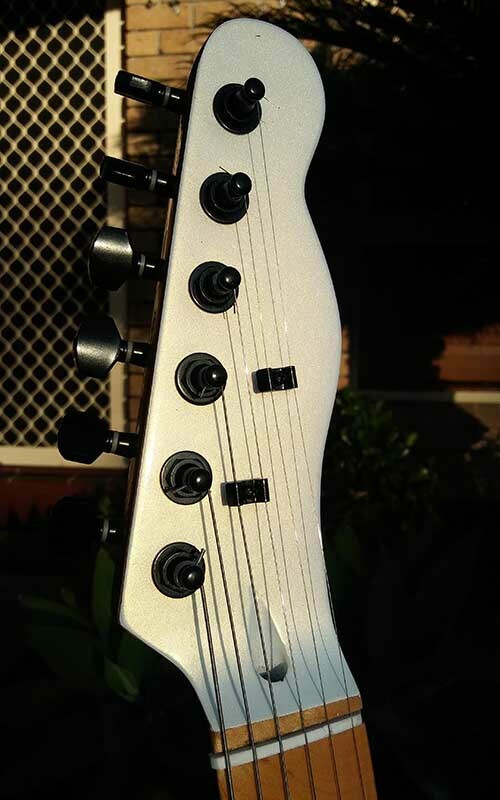 Both the neck and fretboard are gloss. 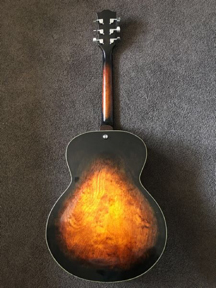 Actually the whole guitar is now that I think about it . All finishing done with a spray gun. You simply cant get as glossy/flat a finish using a brush or cloth. 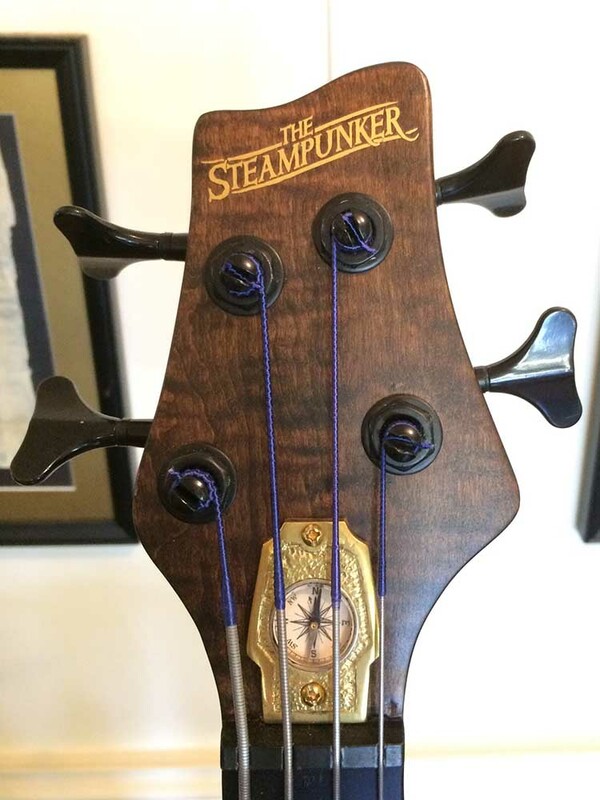 SonicMountain’s Steampunker YB-4 Bass kit is the Judges’ pick this month. 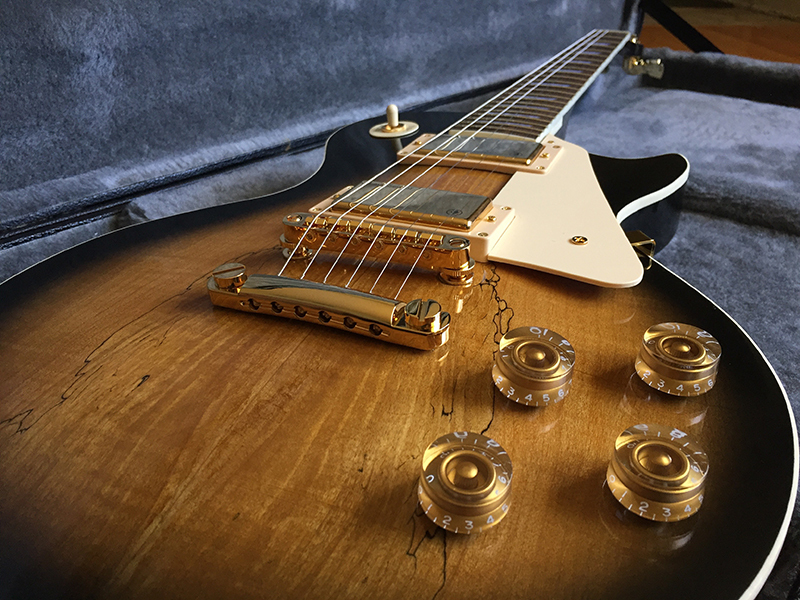 As per the build thread I finally got some suitable strings and completed setup today. 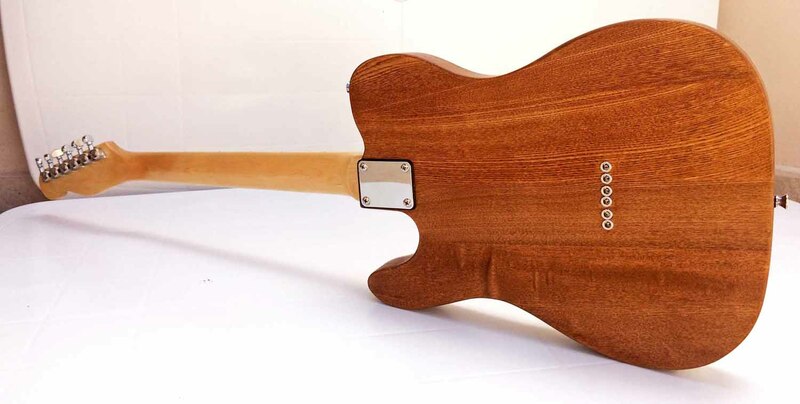 So, it’s based on the Y-B4 kit it has a maple neck (With an awesome flame in it) and a bass wood body. Finished in Japan Brown stain with Cabots satin exterior poly. 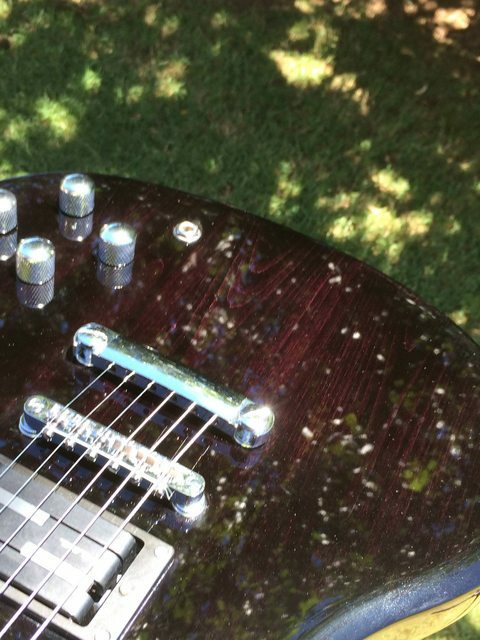 Fretboard stained with Japan Black and sealed with poly. 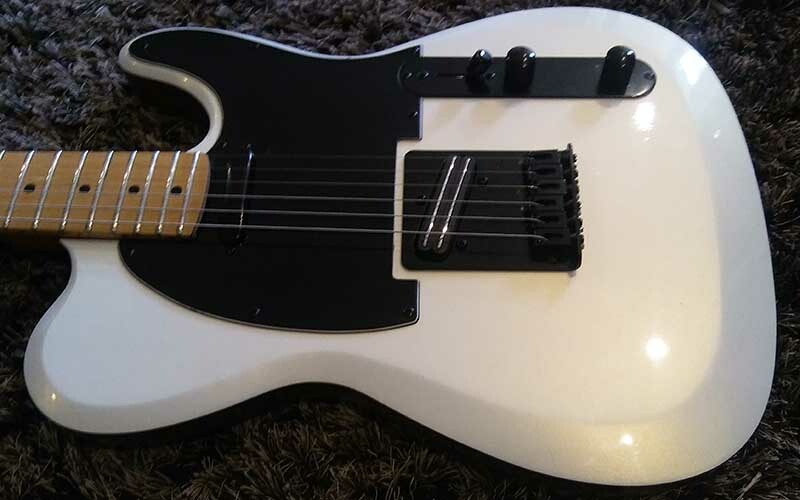 Stock pickups, after market pots and 3 way switch and ‘custom’ wired similar to a Telecaster. You can see the impressive amount of work that went into creating this Beast in SonicMountain’s Build Diary, here. 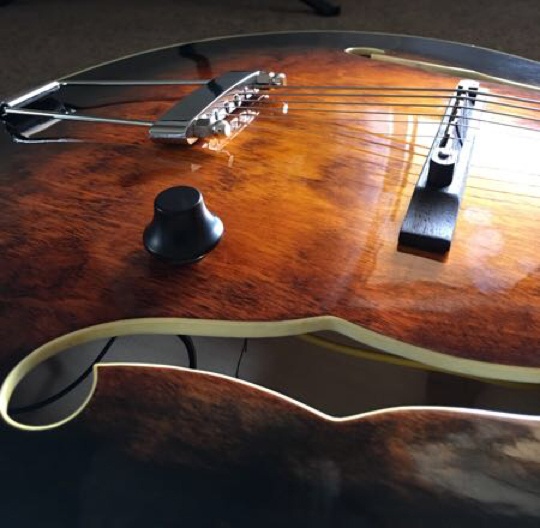 EdGomes surprised everyone with his TLA-1 with “Double Purfling”. So good. 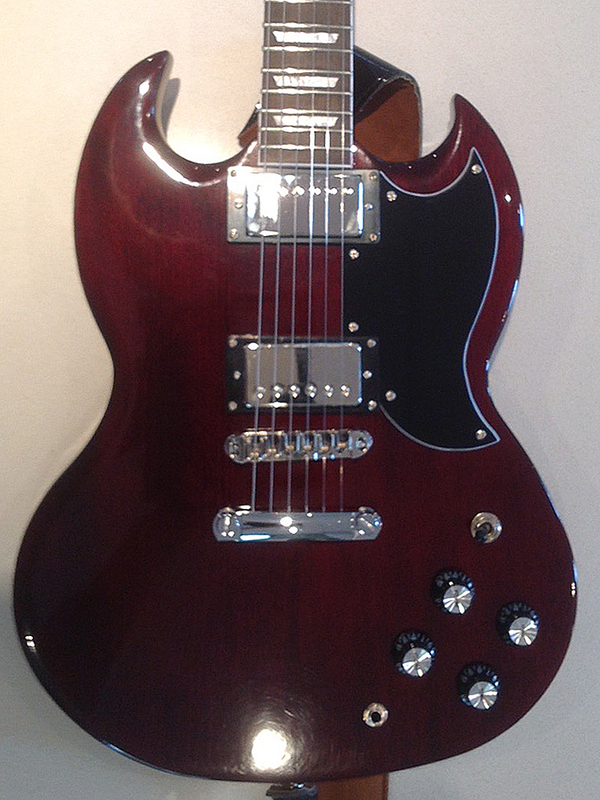 The guitar looks good, plays smoothly, more mods will come such as electronics, nut, jack and strap locks. 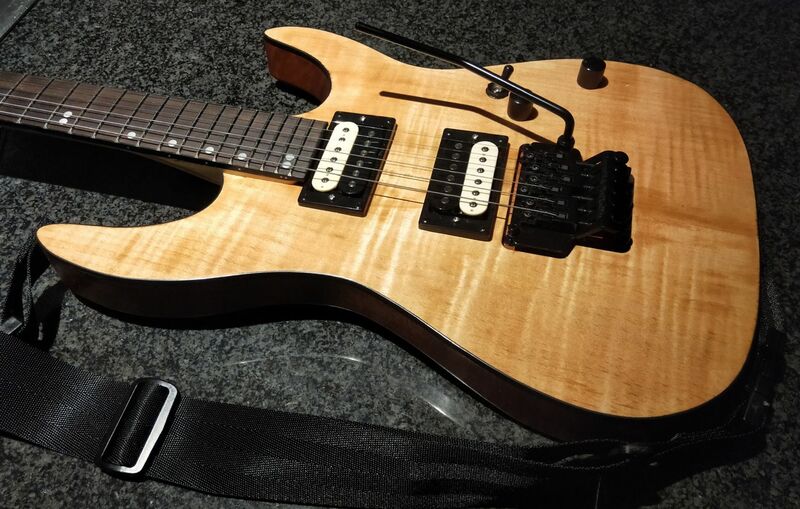 The pickups are very balanced, I love it. 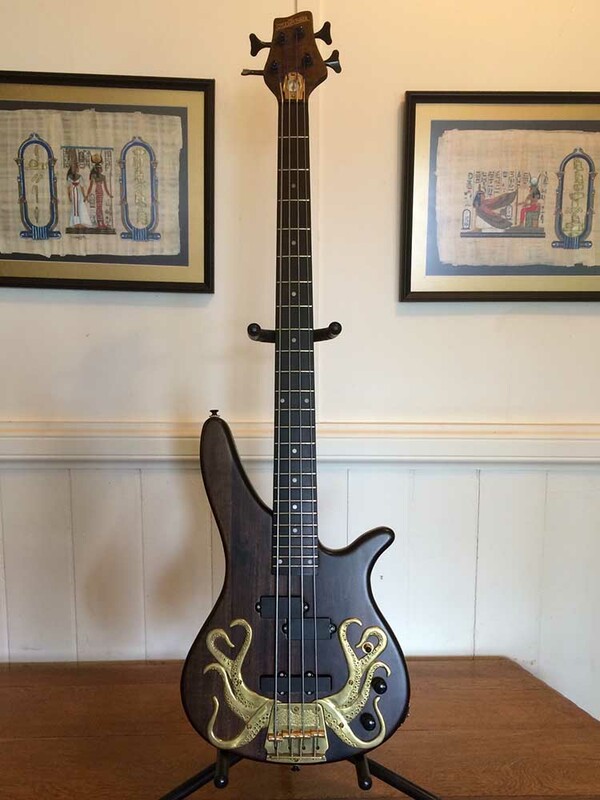 DarkMark’s ES-5V was the Judges’ selection for GOTM October 2018. 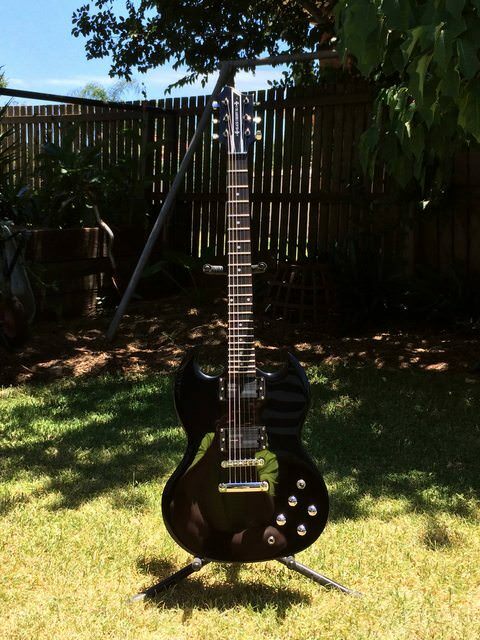 GOTM for September 2018 goes to Andyxlh’s Custom AG-1 in Mahogany finish. 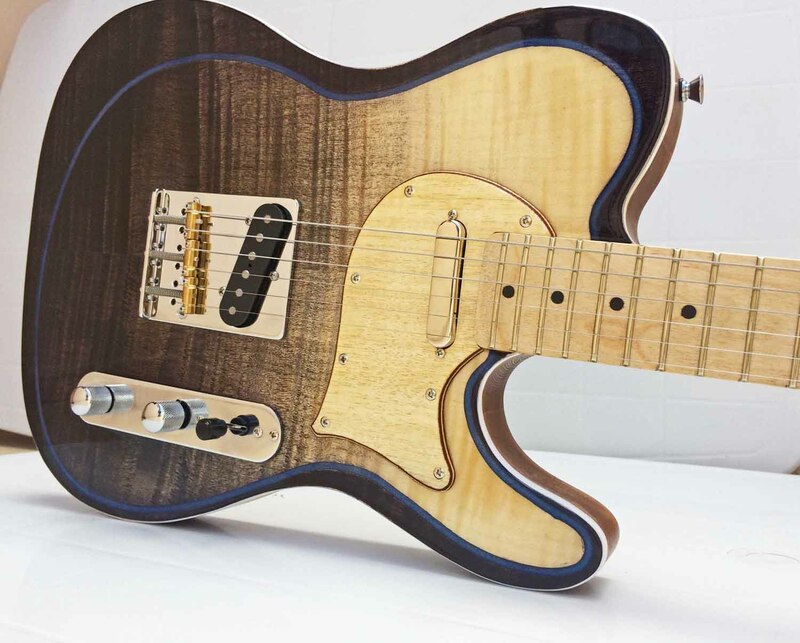 Custom AG kit, ordered with block inlay bound neck, Mahogany neck and body. Roller string saddle, otherwise all the bits are stock. The tone controls are not wired in (like Angus) and the knobs are unused castoff from my RC4 kit. The machine heads are stock with buttons bought from eBay and adapted to fit. Managed to lose the treble rhythm washer, but I’m ok without it! 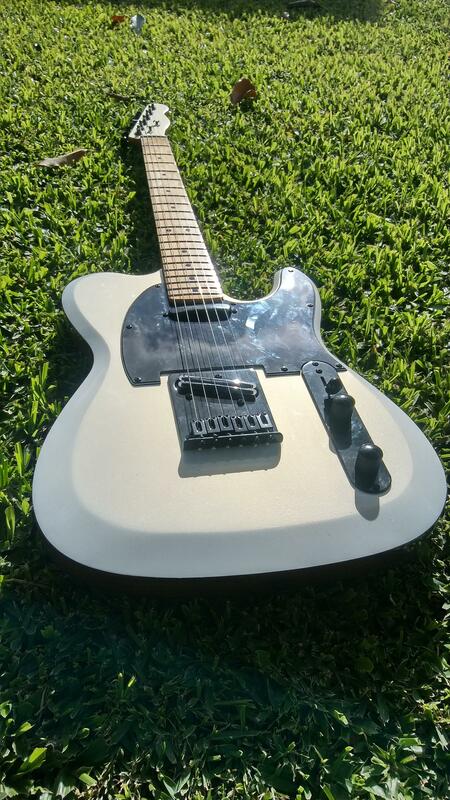 Blinddrew’s understated ES-5V, with clear stain and handmade touches is the GOTM for August 2018. 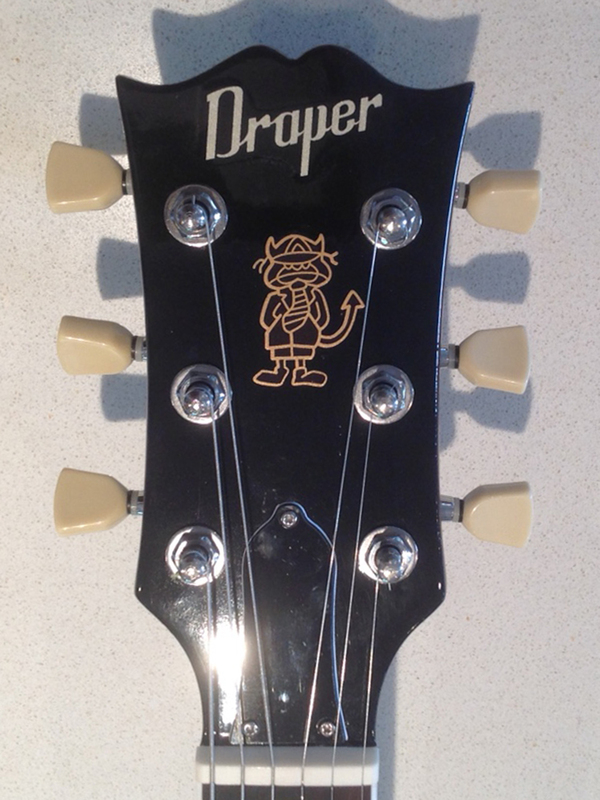 Grover tuners, bone nut, upgraded CTS pots, Schaller strap-locks, home-made knobs, scratch-plate and truss-rod cover. 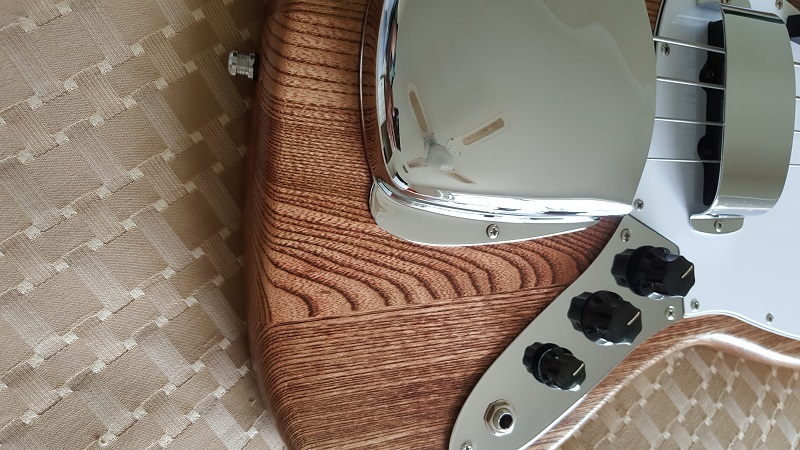 FrankenWashie’s Custom ST Kit, with a stunning Natural finish, was the Judges’ choice for GOTM July 2018. 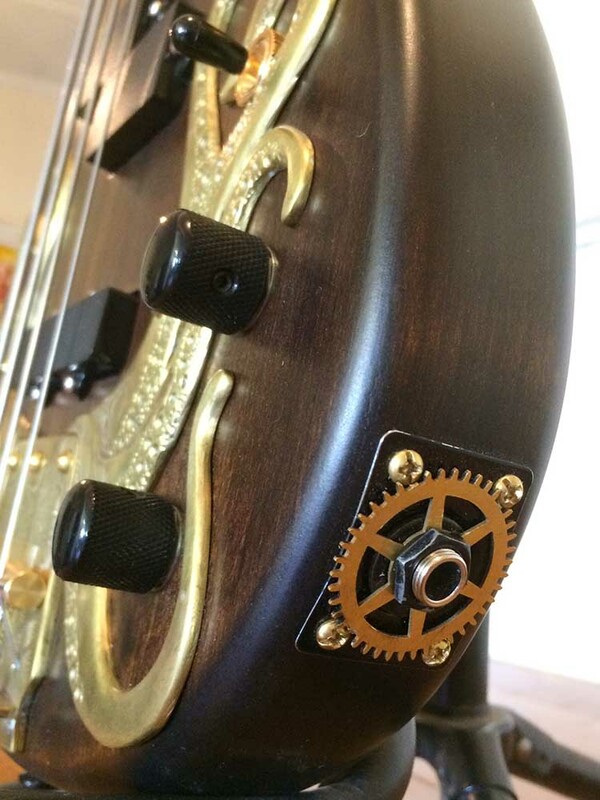 – aftermarket Gotoh string trees. 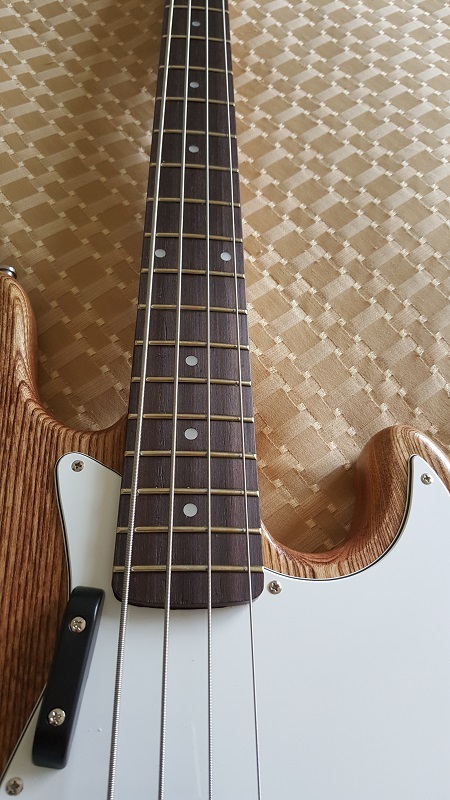 The finish is clear gloss Rustoleum on the body, and DT clear on the neck, finished Satin for easy playing and it is SILKY to play. I have deliberately left the body unfilled to highlight the grain structures and pattern. I wanted the body to remain a tactile element under your hands as you play and handle it. 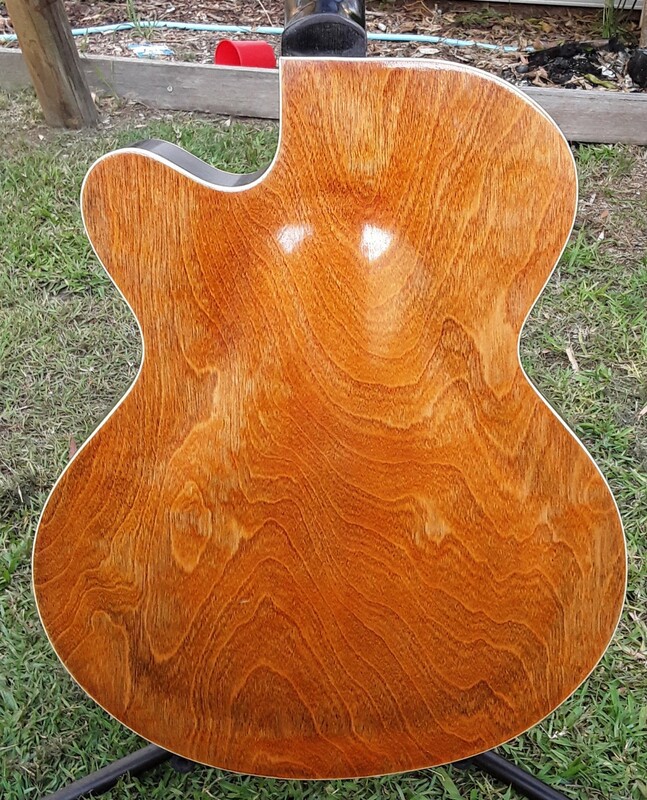 It is a similar story on the head, allowing the finer grain feel to come through on the front and rear. 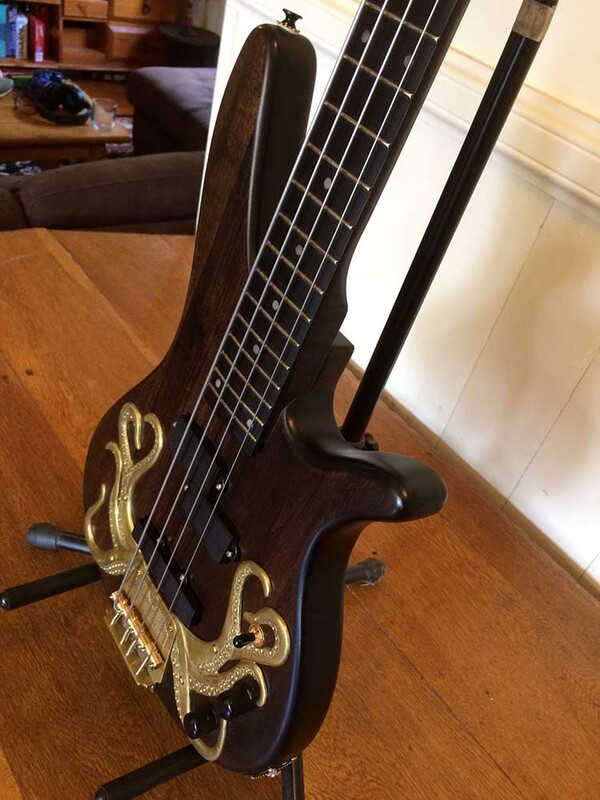 The finish and choice of mods and upgrades on this JM-1 build, by Nitroburner1000, are on another level. 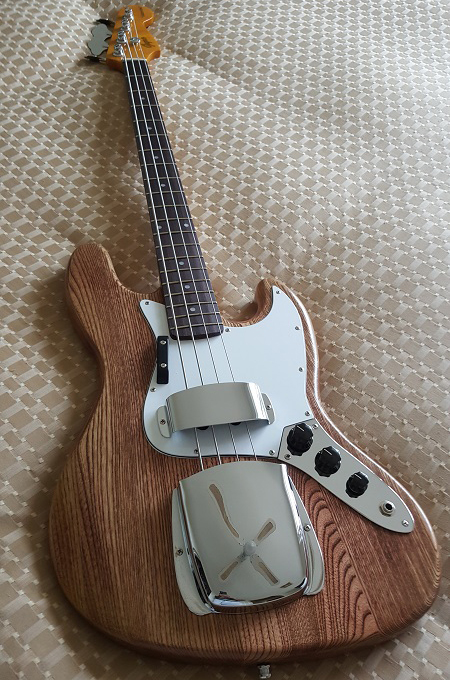 “As the JM-1 comes with a Fender style bridge and is not setup for a jaguar bridge and tremolo assembly, I had to custom route for the bridge and tremolo setup and custom make the pickguard from a blank. 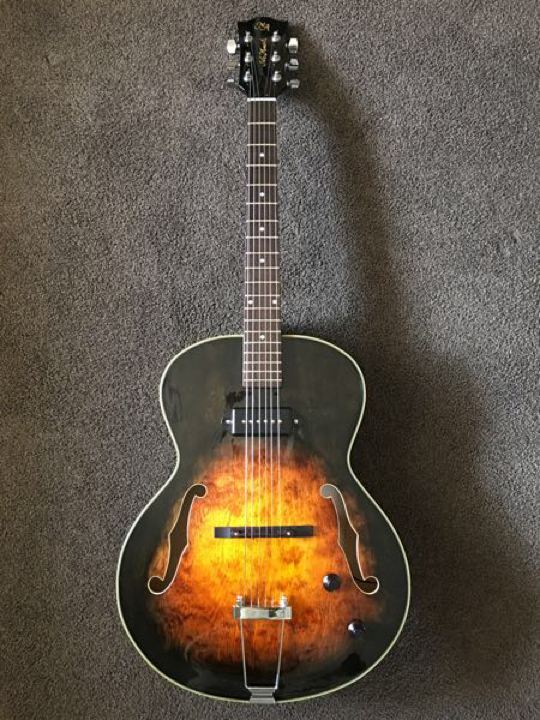 This guitar is setup like a normal jaguar but with these differences. 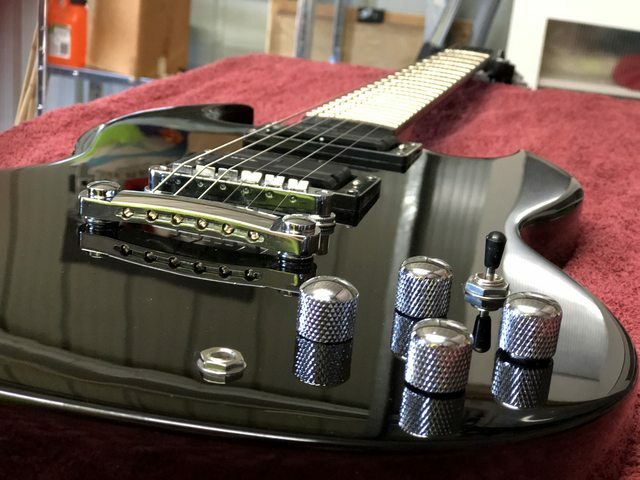 The top horn switch in the up position activates the neck pickup with a separate volume and tone control set in the chrome add-on. 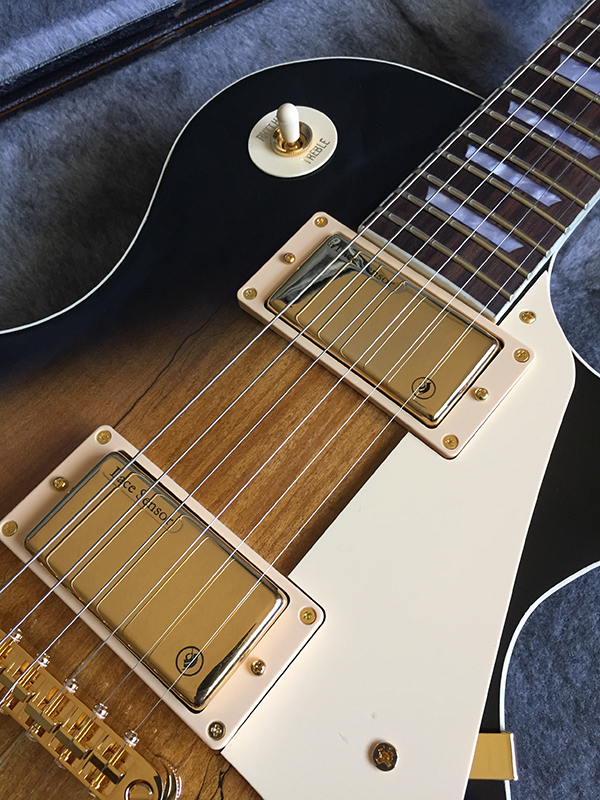 When the switch is in the down position it activates the humbucker and the middle pickups with their separate bass, treble and volume knobs. The difference here is that the lower 3 switches have been wired as 1) master volume 2) treble cut tone 3) bass cut tone. 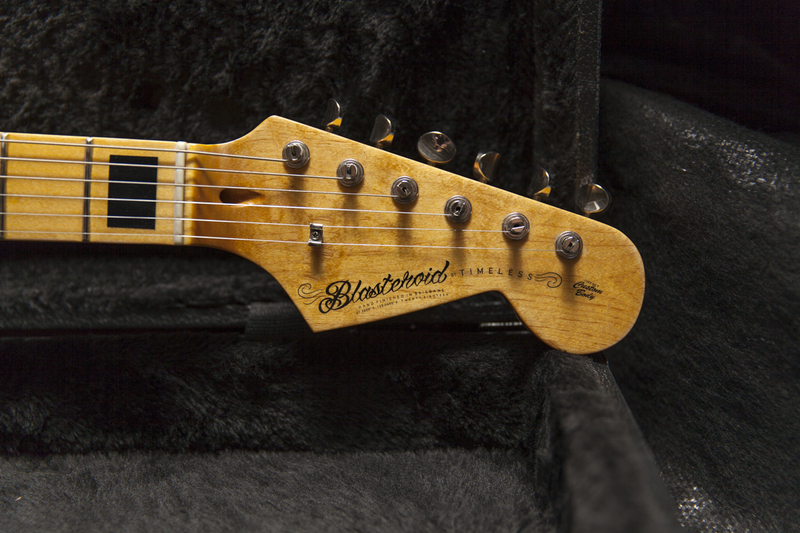 These are generally referred to as G&L Style PTB Tone Stacks. They have a very interesting sound. The last 3 switches are on and off switches for the 3 pickups. 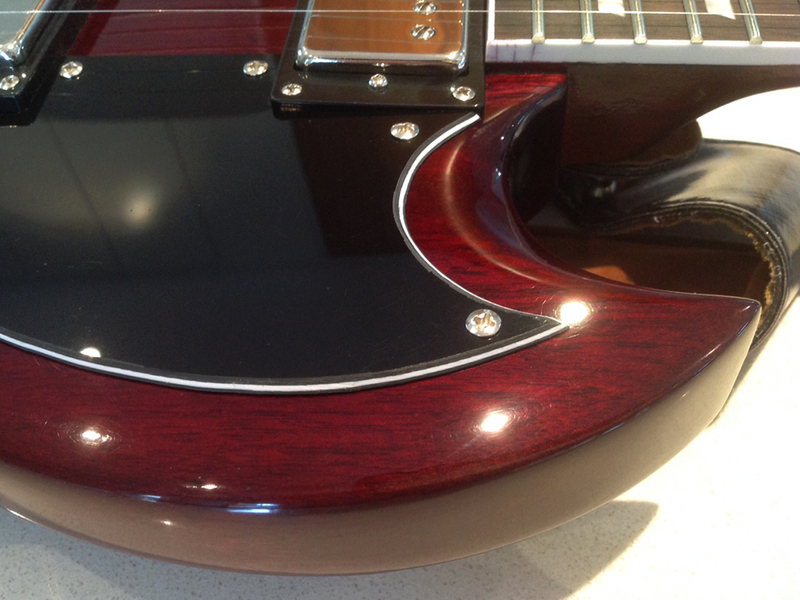 The body and headstock are finished in candy apple red with a 2k clear over the top. It has 4 primers, 3 silver basecoats, 3 cherry apple red coats, 2 clear coats, then 2 more cherry apple red coats finished with 4 coats of clear. 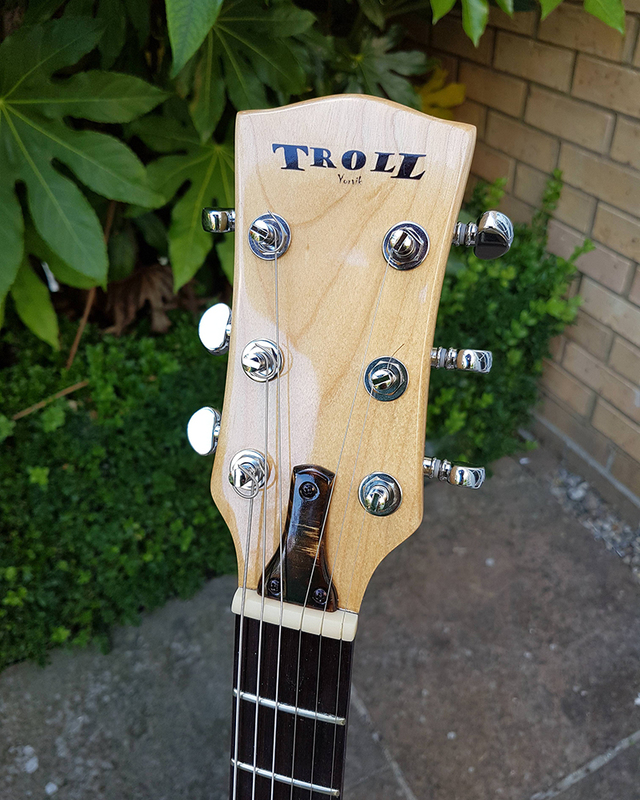 The headstock decal was redesigned by (Forum member) SonicMountain, painted and applied by myself and coated with 6 coats of wipe on poly then polished. 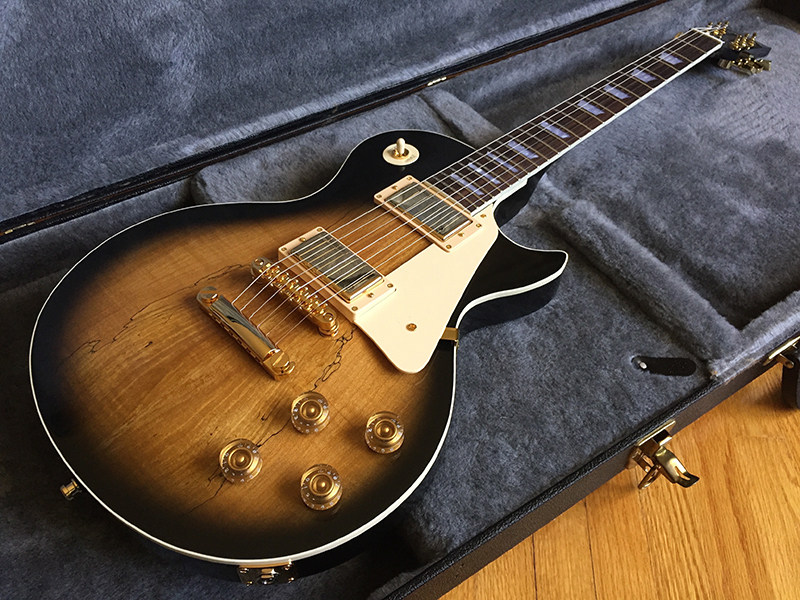 This stunning LP-1SS, by TRV, is Guitar of the Month for May. – Various guards, rings, knobs, etc. 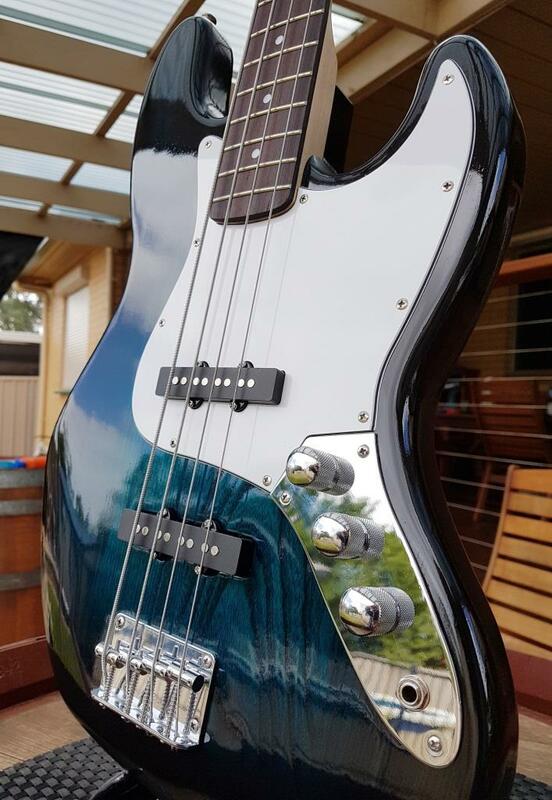 2 Months in a row for our JBA-4 Ash body Bass kit. 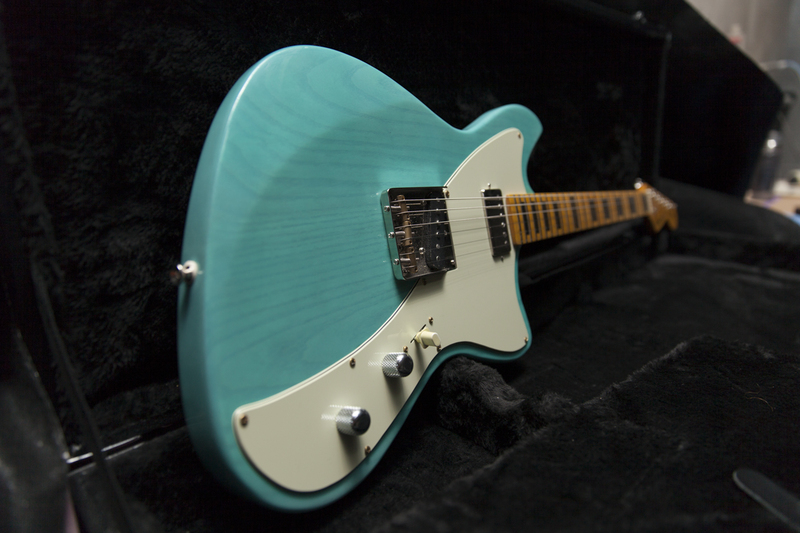 This month Guvna’s JBA-4 was the Judges pick for Guitar of the month. Can’t fault that Blue stain. 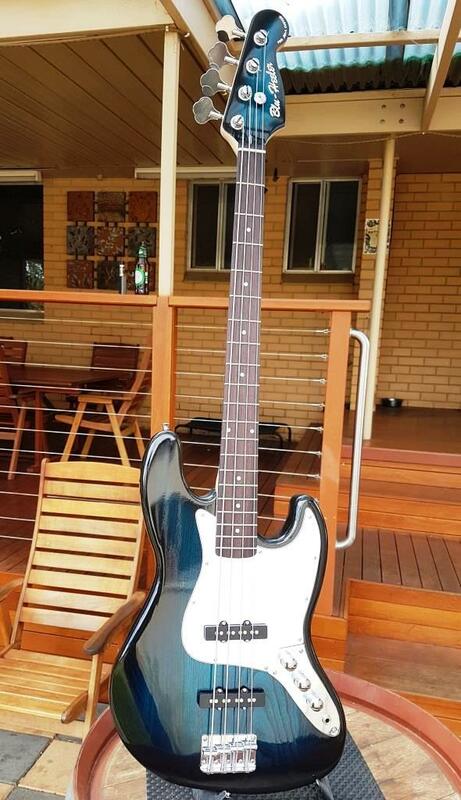 PBG Jazz Bass Ash Body with Blackwood neck. 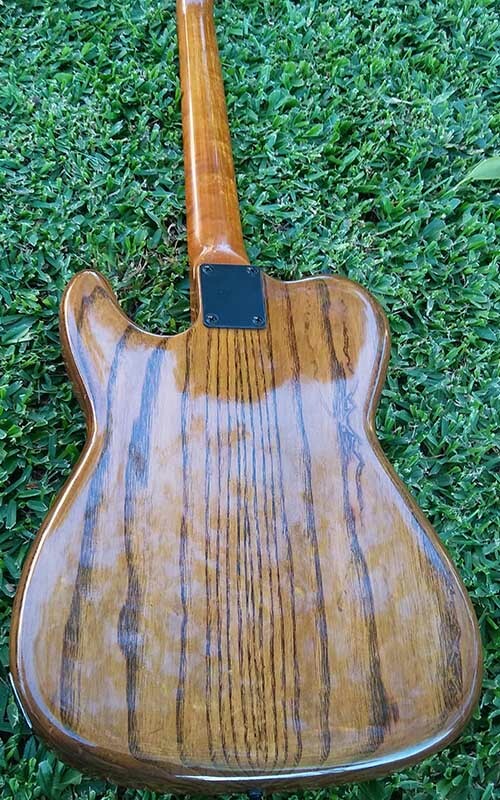 Vintage Amber Colortone stain….about ten coats of Tru Oil and then Bowdens Own Carnauba Wax. Vintage push back wiring everywhere except for bridge earth wire. 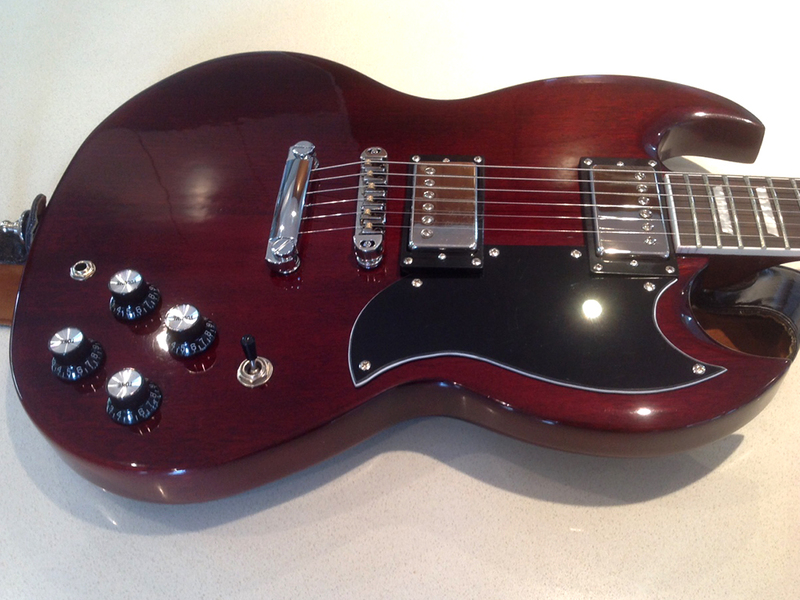 Sonic Mountain’s “Black Cherry” SG-1 was the judges’ pick for February 2018 Guitar of the Month. 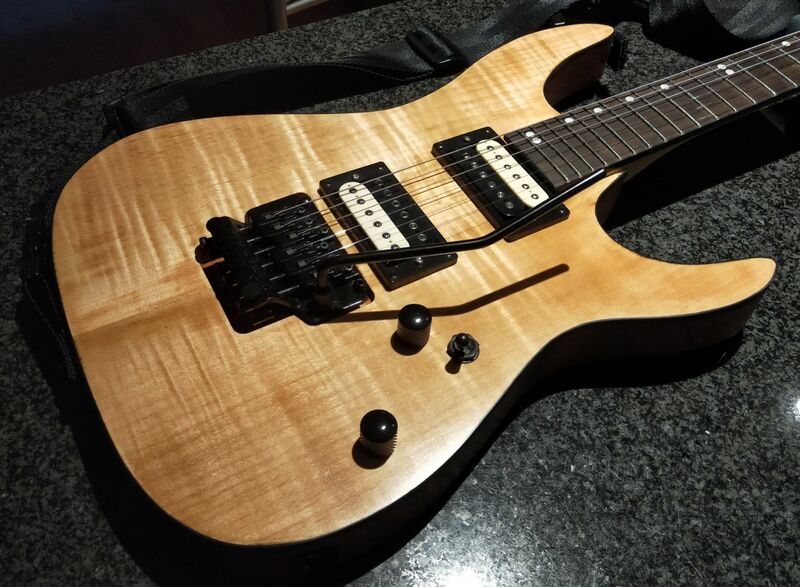 Stock bridge, nut and Tail Piece – to be upgraded at some point, but are actually quite nice anyway. Finish is Black stain, red fountain pen ink, black stain again then multiple coats of Septone clear top coat and about a million hours of cutting and polishing. 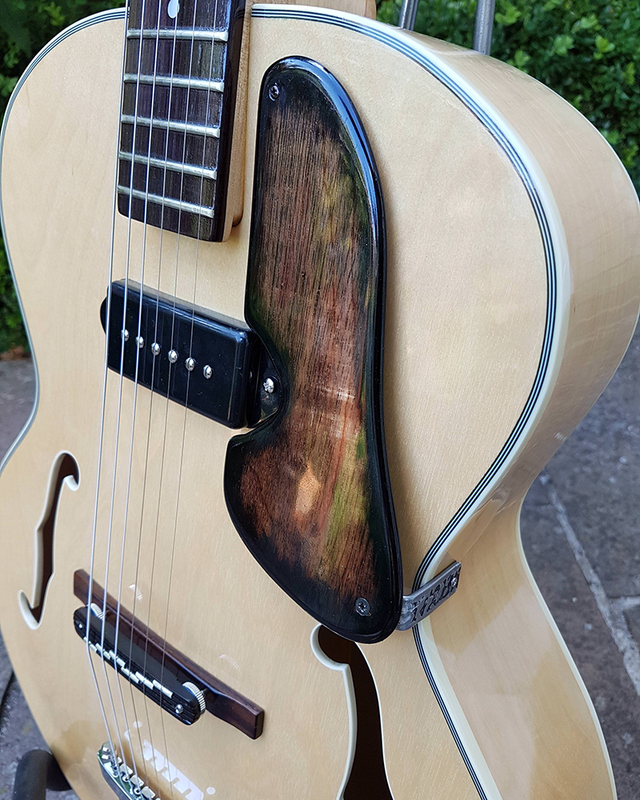 Congratulations to Adam Barnes, whose stunning GR-1SF was the Judges’ pick for January 2018 Guitar of the Month. 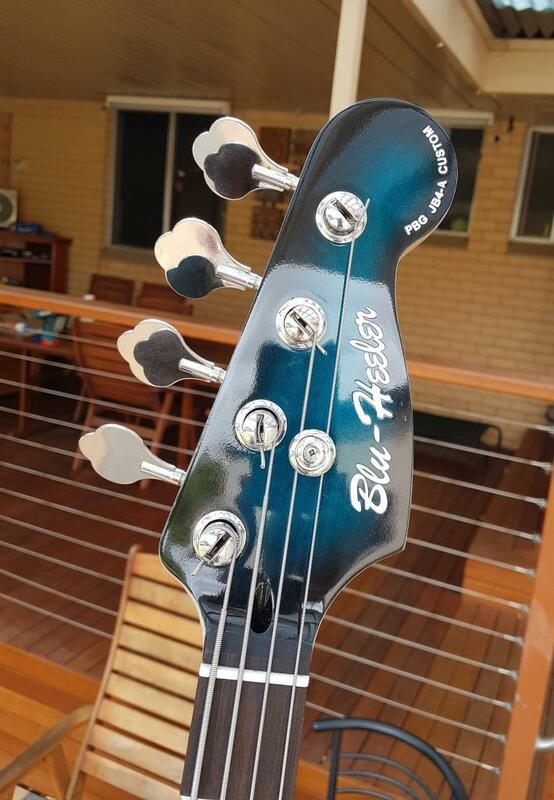 Specs: GR-1SF stained with Dingotone Bushfire Sunrise and Black Stump, clear coating with Tru Oil. 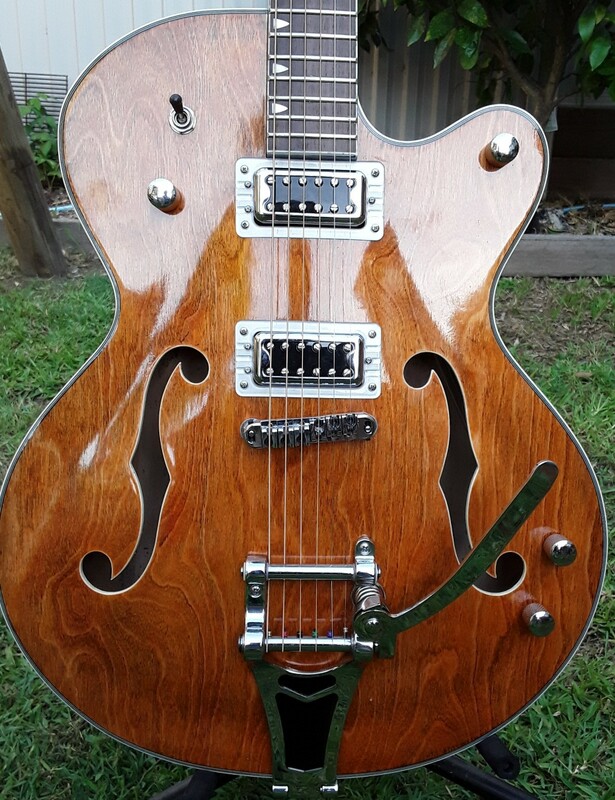 Upgrades: Gretsch Blacktop Filtertron pickups , Bournes mini pots, braided wire, Graphtec tusq nut and a Roller bridge.